CUSTOM Choose your own amount of tiles. Reduces tripping hazard by providing a steady incline to 1/2" tall floors. Description - Our 1/2” thick Rubber Gym Tiles are ideal for use in heavy duty commercial applications. These tiles are available in border, corner, and center cut tiles to help fit a variety room sizes. The Rubber Gym Tiles also have an anti-skid diamond pattern surface for added safety and are non porous and non absorbent. This means that the tiles are slip resistant in wet environments and easy to clean up since none of the moisture is absorbed. These tiles are also safe to use outdoors and are resistant to bacterial growth. Note: - Due to the manufacturing process and nature of recycled rubber, some surface variations such as color distribution or shadowing may exist. Material – Rubber Gym Tiles are constructed of recycled black crumb rubber and virgin colored rubber flecks at a 25% and 75% color density. These recycled interlocking gym tiles are also vulcanized which means they are formed using heat and pressure to form a solid non porous and non absorbent mat surface. This allows for the gym tiles to have the highest tensile, tear, and abrasion resistance on the market for a rubber tile. This means unmatched durability and longevity. Weight – 2'x 2' tiles weigh ~12 Lbs. each and 4'x 4' tiles weigh ~52 Lbs. each. 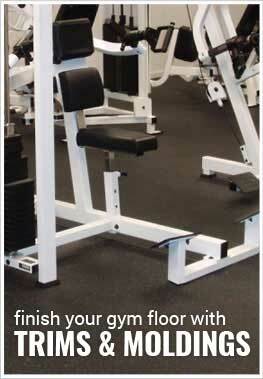 Recommended Uses – The 1/2” thick Rubber Gym Tiles have been used successfully in a variety of commercial applications. 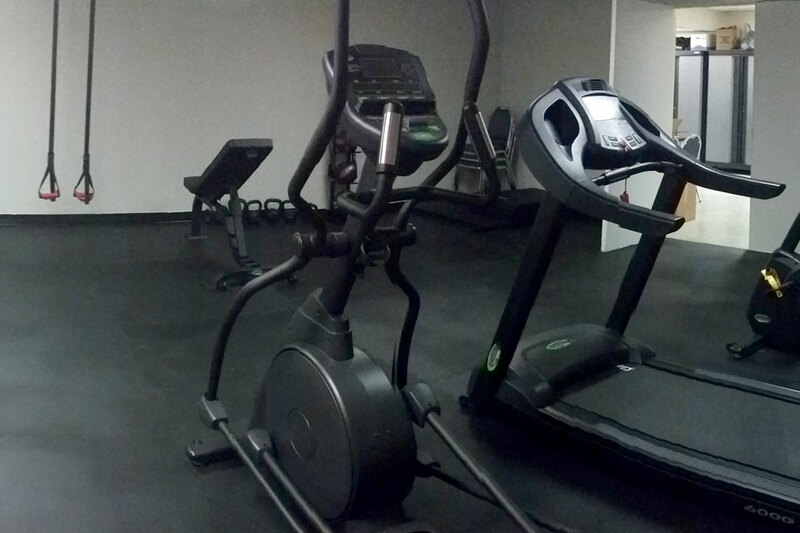 Some common areas where these tiles have been used include in power lifting gyms, commercial weight rooms and physical fitness facilities, in physical rehabilitation centers and performance training facilities, in lockers rooms, around ice skating rinks as a blade resistant flooring, in baseball dugouts as a spike resistant flooring option, as doggy day care flooring, as cow mats in barns, outdoors on decks and patios as slip protection, in garages and storage sheds, in children’s play rooms, as a utility room flooring, in basement home gyms, as general anti fatigue flooring and sound insulating flooring, as a “green” flooring option, and in any other location where a low cost yet highly durable rubber tile option would be beneficial. Vacuuming any loose crumbs, dust, or debris from the floor surface when necessary. Occasional damp mopping of the interlocking mat with a mild soap and water solution. A few recommended soaps are Dawn dish detergent or Tide laundry detergent. Start in one corner of the room with a corner tile and add borders tiles outward along the adjacent walls. Add center, corner and border tiles where you see fit. After the field is covered, go back and cut in tiles along the opposite walls in the room. It is recommended to leave a gap along the wall roughly the thickness of the tiles being used to account for expansion and contraction of the floor in varied temperature ranges. Black ships within 3 bus. days. Corner and border pieces can be beveled upon request. Easy to install non-porous tile system comes in corner, border, and center tiles. I am looking for a flooring I can install over carpet for a home gym. I had used horse stall mats before but it left marks on the carpet and had a strong plastic smell. Our Rubber Gym tiles can be used over low to medium pile carpets, but high pile carpets can cause the tiles to separate. Light colored carpets do have the potential to be stained by our tiles due to them being black on the bottom. An easy solution to prevent staining is to place a thin plastic sheet underneath your tiles. Our rubber gym tiles do have a slight rubber smell to them, but this smell will dissipate over time. Are border and corner tiles 2 x 2? I did not see any pics. 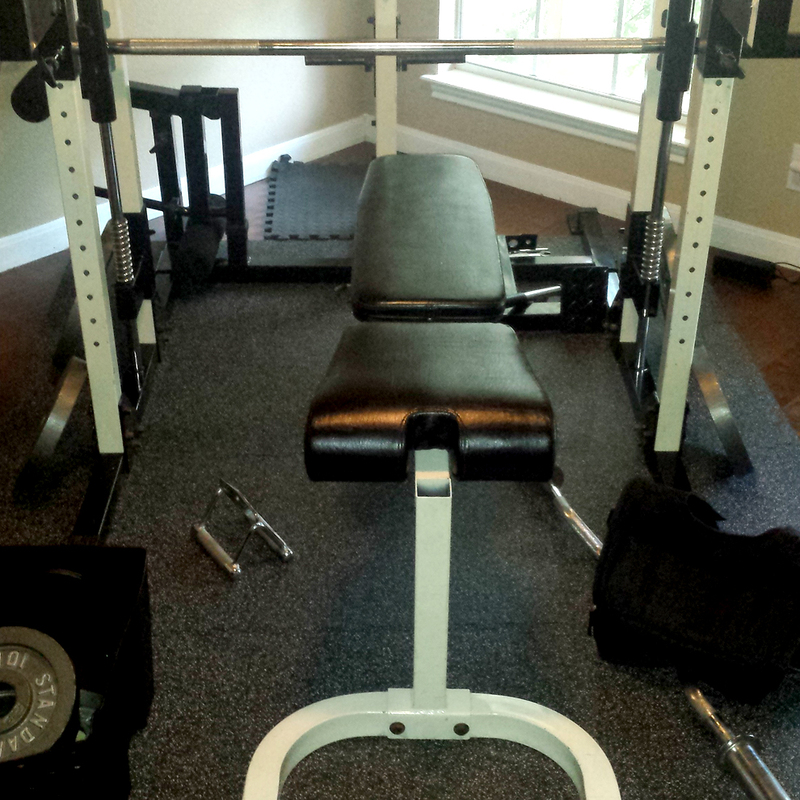 1/2" Rubber Gym Tile borders and corners are 2' x 2' for our 2' x 2' tiles and 4' x 4' for our 4' x 4' tiles. Will two, 2' x 2' tiles interlock with one, 4' x 4' tile? Two 2' x 2' tiles will not interlock with one 4' x 4' tile. I just installed the flooring in a music studio, which is total enclosed. There is a VERY strong rubber smell. Will it go away, and if so, how long will it take? Is there anything I can do to help get rid of it? It's really bad, don't want to be in the room. The smell associated with our 1/2" Rubber Gym Tiles will dissipate over time. The best way to speed this process up is to mop the floor with a mild soap and water solution. We then recommend to let the flooring air dry in a well ventilated space. This process may have to be done a few times to truly get rid of the smell, but this is the best way to remove the rubber smell. What is the best way to cut the 1/2" tile? I want to make a nice fit around the walls in the room. The best way to cut our 1/2" Rubber Gym Tiles is a sharp utility knife and a straight edge. Multiple scores with the knife a typically necessary, but this is the best way to cut the tiles and keep a nice clean look. You can use a jigsaw on low speed with silicone or water, and this too can effectively cut the tiles with ease. This is our new outdoor workout area and observation deck (top of picture). 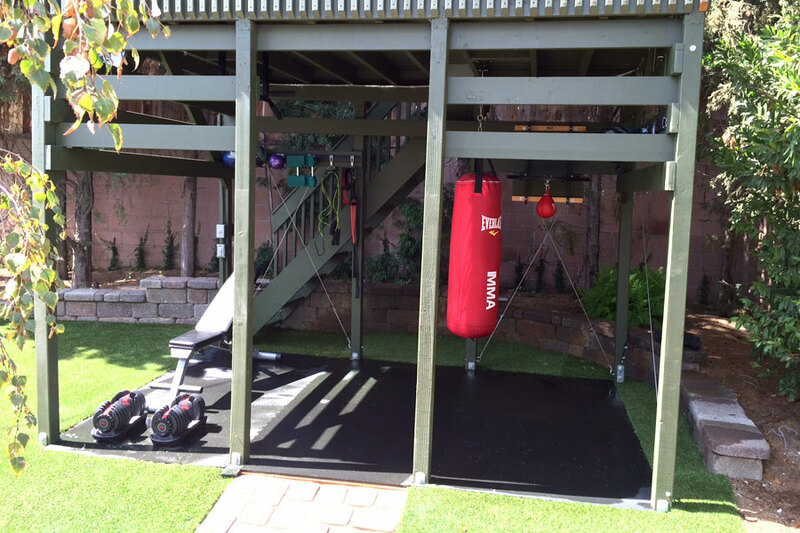 One of the pleasures of living in Southern California is the ability to build an outdoor gym that can be used year round. We ordered 28 of these 1/2" thick 4'x4' tiles to tile our gym room. The tiles seem to be well made with consistent pattern and thickness. I was able to cut them with a utility knife (razor knife), the trick is don't be in a hurry, make multiple passes per cut and switch to a new blade after 2 or 3 tiles. For more complex cuts I used a jigsaw. The result looks really nice, I was able to cut them to fit perfectly and they lay nice and flat on the floor. The puzzle like pattern keeps them together nicely. For quality of construction I give them 5 stars. However they have quite a strong rubber or chemical smell, and for this I'm removing 2 stars. Our room is approximately 400 sq feet and it is enclosed in South Florida, currently without air conditioning. In the afternoon when it's warm in the room (about 95 degrees F) it's almost difficult to breathe until we open the windows and doors to air it out, and the smell gives me and my wife a headache. It has only been installed for about a week so I'm hoping the smell will go away with time. The smell is my only complaint about the product. Also, a trait that I suspect is the same with any rubber floor, powdery type dirt sticks to the rubber (if someone walks in from outside with dusty dirt on their shoes) and the vacuum won't lift it. However brushing it with a broom loosens it and then the vacuum will pick it up. So in summary, for quality of construction I give it 5 stars, but for the powerful chemical/rubber odor I'm taking away 2 stars, for a final score of 3 stars. We just installed the rubber floor at Parker Hannifin in Forest City. The install went smooth and the floor looks great! I would send a picture but I don`t think this format would allow it. Thanks for a great product. Exactly what I was looking for! Thick, easy to assemble, and functional. There is an "off gassing" time for the rubber smell to dissipate, but eventually it does. Actually have to order a few more, my only request would be to have the ability to put on "edges" to apply in order to accommodate odd tiles (like a three sided tile, or tile out by itself).